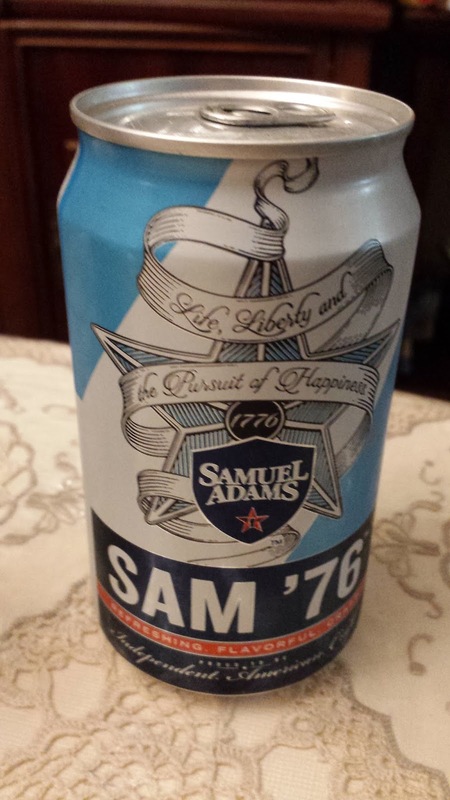 This week's Sunday Night Suds looks at Samuel Adams Sam '76 (in honor of my nephew Sam and his love of flags). The Sam '76 claims to be an American Pale Lager and it comes in a patriotically decorated can, complete with the logo "Life, Liberty and the Pursuit of Happines" (which I was expecting to actually read hoppiness, but I guess that they were not feeling punny). Sam '76 is a perfect union of lager and ale, giving you a craft beer with the flavor of an ale, giving you a craft beer with the flavor of an ale and the refreshment and crisp finish of a lager. The result is revolutionary. The Sam '76 to me is very little ale and almost entirely lager. The notes indicate that the beer is 4.7% abv with 12 IBUs, but I don't detect much in the way of bitterness and the alcohol content seems more akin with a light beer. This is the kind of beer that you can bring to a BBQ at at friend where most of the participants are into American macrolagers. They will ooh and ah about how this is Sam Adams, but even though it has the Sam on the label it unfortunately has the heart of a Bud and even the can packaging looks similar to the great American stalwart. That's not to say that the beer is unpleasant, but it is a let down from a beer company which usually produces beer with more flavor and character. The Sam '76 is under the Kosher Supervision of the Star-K and has a Star-K certification mark on the side of the can. To see what the experts on Beer Advocate think about this brew, please follow this link - beeradvocate.com/beer/profile/35/317014.